Nuvation Energy’s battery management solutions for large-scale energy storage are helping reduce the world’s carbon footprint. Join us in making a difference! We are looking for an outstanding Front-End Web Developer who has a strong foundation in web development best practices, experience designing user interfaces and user experience design. You will be responsible for the programming, maintenance, feature implementation, and management of cloud and web-technology based solutions for our Nuvation BMS™ product line. Our Nuvation BMS™ leverages web-technologies for the device user interface and our nCloud is a customer portal to configure, manage, and communicate with our systems around the world. We’re looking for a talented and motivated developer to realize our current product roadmap and help identify the next enhancements. You will be working on the front-end design and rendering data from the various data source points. At Nuvation we are fanatical pragmatists who revere logic, process, repeatability, and methodology. You will be working with highly competent team members who are wired to respond to challenges with innovation. If you are looking for constant challenges and want to join us in our exciting future, this is the job for you! Technical Leadership – You are responsible for identifying best practices and implementing. The ecosystem you establish will be leveraged by future developers to build out new features and functionality. Mentoring – Mentoring is a key value in Nuvation's Culture. You are responsible for guiding individuals to grow and be savvy developers in your primary discipline. If you have an online portfolio, tell us about it! All Nuvation employees require a common set of general skills & characteristics – your capability in these areas will enable you to be successful here. We take these skills and characteristics seriously – being a Nuvation employee requires more than just experience and role-specific skills. Nuvation offers competitive salaries with health, dental, vision, and disability benefits. All positions have opportunities for variety, innovation, and success. We have a fast-paced, yet relaxed work environment, and a unique corporate culture that will support and encourage you to perform at your personal best for your colleagues and our customers. We promise you respect, teamwork, and appreciation for a job well done. Nuvation Energy and Nuvation Engineering share the same facilities, with an office in Silicon Valley, California and another in Waterloo, Ontario. Nuvation Engineering provides a comprehensive range of electronic design services and has completed hundreds of complex projects since 1997. 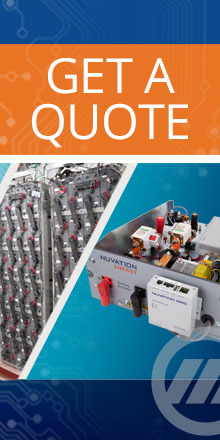 Nuvation Energy provides battery management systems and energy storage engineering services to battery manufacturers, system integrators, and other organizations across a wide range of market sectors. We love the work that we do and enjoy working with each other every day. Please attach a copy of your resume. Upload a zip file for multiple file submissions. Allowed types: pdf doc docx odf rtf. Copyright © 2019 Nuvation Energy. All rights reserved.